Export the database as in the format of CSV to open it in the Microsft office (MS)-Excel. 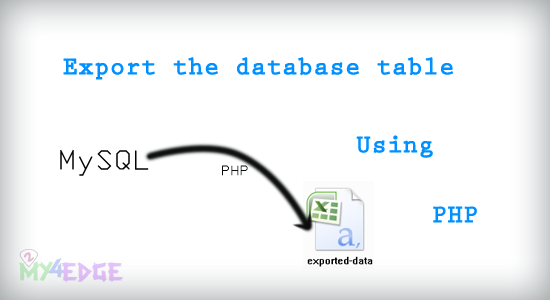 Most the social media sites and E-commerce site and more sites or this kind of database export coding for without going to admin panel, just in one click export the database table as in the format of CSV to open it in MS-Excel. Just on a click export the database table, using PHP code. let see how it works. as in the db.php file, make this. and as you, here i just declare what i have given in. this file is just for do the download, just give the link anchor tag, usually you know to make just click export the data, for that just give the link on anchor link, that will export the data table. as given in the above line. just do it as i mentioned the above. based on ur script ur csv only preview all the data from ur database, right? but, how about if the user want to view or read the file of csv only one field such as place = India? Just modify ur select query.. Thank you. Simple code, written like a pro. Would you be able to tell me how I can export multiple tables with a single click. ty for this beautiful code..can i use this same when accessing export.php file from putty that will automatically save this exported.csv file in a folder in ftp? does it work with all characters? Does it work with Khmer Unicode character, UTF8? Great tutorial! Would it be possible to mark the records as exported when the xml is generated and only export records that have not been exported on each run. Additionally, could the column names be defined in the xml differently than what is defined in the mysql table. good but it work if you need data for diferent, tablet in the same database. Suppose I have some ids form other tables then exporting one particular table will print those ids not the values corrosponding to those ids. Thanks, it's work for me! apostrophe in data causing trouble, how should I avoid that? Thank you. It works beautifully, without any hassle. GREAT! Thanks alot for the code, it work perfect like a charm!!! can you make more tutorial on mysqli. to create a database or export to a website that is very xylophone, just that we need to learn, because we also learn the language program.